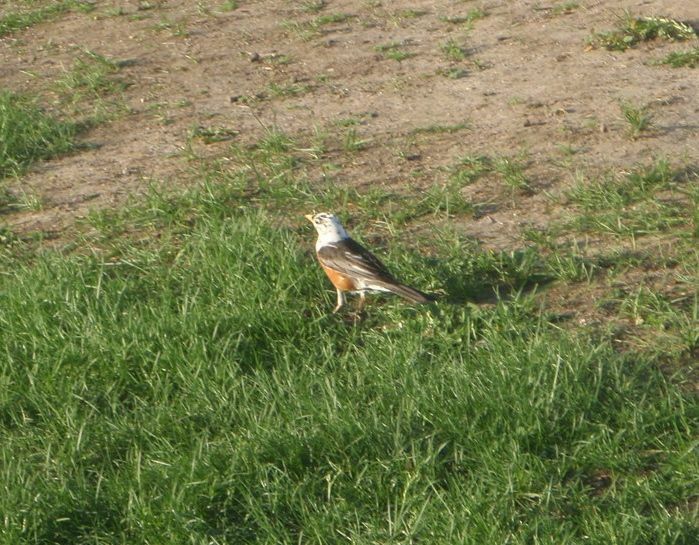 There is a white-headed robin that lives in the green space around our condo. We call it The White-Headed Robin. It’s pretty much the coolest bird I’ve ever seen. We noticed it last spring (2012) and for some reason I was surprised to see it again this spring. I had never thought about the same exact birds coming back for our viewing pleasure year after year. It did not occur to me that birds were individuals and would either survive or not survive the winter and then come spring be frolicking about their old hangouts and favorite spots. Seeing this bird brought the realization home. The White-Headed Robin is unlike any other robin. It is totally unique. Before seeing him again this spring, I thought every robin was any robin- I made no distinction between them. In my mind they were like a package of nails from Home Depot- interchangeable. But Nature broke it down for me. Now I know every robin is its own robin. And that, my friends, can carry forward. Every squirrel, chipmunk, bunny, hawk, spider, ant, and mouse. These are villages of individuals. Gone are the days when I can say “Hey there’s a bunny.” without thinking about what makes it special. Mind blown. This entry was posted in life in general, self and tagged birds on July 25, 2013 by skylikeme. My son and I saw this amazing Great Gray owl today. Every birder within 60 miles is coming out to look at this sucker who has been hanging out near Madison. This bird is stunning. Intense. Gigantor. A bird like this carries something in its presence. You just have to take some time to stare at it and be awed. Check out this link to more pics from Wisconsin Birding’s fb page. These are not, like, google images of a Great Gray owl- this is the actual owl we saw. This entry was posted in life in general and tagged birds on March 26, 2013 by skylikeme.